Howard’s new football helmet: Hot sauce or hot mess? Howard is celebrating its 125th football season with a new, gaudy helmet. Is it too hot or too much? With the football season inching closer and closer, teams are starting to reveal bells and whistles as it relates to uniform and helmet updates. 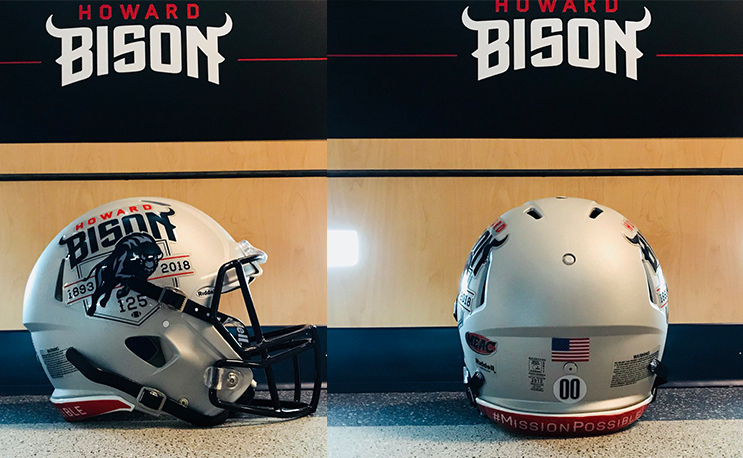 Howard dropped a photo of its new football helmet logo and its a big one. The school is celebrating its 125th anniversary of playing football with a commemorative sticker that’s quite active. The helmet is definitely eye-catching. In the first few hours after it was revealed, it seemed to have a love-it-or-hate it vibe in terms of reaction. It’s great that HU has decided it wants to celebrate its history, but is the helmet the right place for all of that? Depends on who you ask. It reminds me of the 2015 Winston-Salem State football helmet. The helmet was a nod to the school’s tradition with its championship years on the top, and had the state of North Carolina on one side with a Ram logo on the other. The idea was novel but a little too busy and it came off very cheesy. In the end, the most important aspect of the helmet is whether it protects the head of the student-athletes involved. But its late July, and we want to talk football so the debate will continue. Let us know what you think in the comments.